In contrast to strife, deficits and ambiguity, the five internationally acclaimed artists in our current show invite you to slow down, contemplate, and enjoy the tranquil beauty of a pure aesthetic. 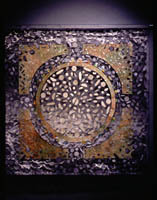 Emphasizing the surface, their work becomes a sublime expression of spirituality. It is simply beautiful. Junco Sato Pollack uses shibori, digital printing and thermoplastic techniques to create her elegantly contemporary textile prints. She masters technology with the touch of the hand. 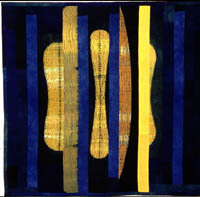 Far removed from the modern technology in Pollack's work, Frank Connet's background in textile conservation influences his use of natural dyes, such as indigo, madder root, and walnut husks. He searches for true historical color and then restructures his dyed fabrics into dramatic arrangements. Jason Pollen creates magic with dye and silk. His pieces emerge like notes from a song, snippets of color and light that dance across a plain. They invoke awe and reverie. Tetsuo Fujimoto uses stitching to manipulate the planar surface with wrinkles, drapes and distortions. He encourages us to observe the coexistence of the macro and micro world. Finally, we include the fabrics of Reiko Sudo, founder of NUNO of Japan, whose brilliant manipulations of cloth create rare, gorgeous materials intended for clothing. We hope that the exquisite beauty of our show allows the observer to experience a sense of peace and timeliness in a world without boundaries. 25" x 25" x 8"
83" x 157" x 8"
25" x 25" x 0.8"
69" x 123" x 6"
71.7" x 119" x 6.7"
65.7" x 124" x 7.9"